Are Your Profiles, Posts, and Properties Assets to Your Online Reputation, or Liabilities? Reputation problems originate from a variety of predictable sources for a common set of reasons, and there is commonality in the types of websites that contain the content that typically transpires into something problematic. The typical websites that produce troubling negative content are important to understand and analyze from a search optimization perspective, because the only way to combat the effects of these sites have on an entity’s reputation is to formulate a strategy that speaks to the type, format, intent, and authority these sites possess. The same websites that cause reputation problems can also be powerful assets in the repair process. Only by fully understanding the purpose and influence of these problem websites can one successfully use the same websites as a component to a positive reputation strategy. In later chapters this book covers in detail exactly how to exploit such opportunities, however be advised with an early disclaimer: Posting content to these websites is rarely, if ever enough to produce a positive result in itself. There are dozens, if not hundreds of necessary factors to consider in successfully utilizing these websites for reputation improvement. Moving through many different forms of media, news and editorial content is essentially packaged information about current events or industries. Most printed news agencies, local and national in nature, use a web-based platform for publishing. Some news organizations are centered on strictly digital formats of content. Online news information is such a massively distributed and consumed type of content that search engines like Google and Bing have created search features dedicated to serving news content under an exclusive interface. Search engines display news related content under regular web search results. The articles and stories are often weighted with strong importance and positioned with prominence due to the authority of the news websites on which the content originates. Due to the trust news websites inherit from reader audiences and therefore search engines, news websites are a leading source of reputation management problems. Alternatively, a brand or person with a public relations strategy can leverage the power of news websites to gain top placement in search results with a favorable story or article. Individual and multi-author informational sites consisting of discrete entries (“posts”) allow writers to deliver a scheduled or unscheduled series of chronological article features to the public on any topic. Blogs are often viewed as a channel of free speech, allowing writers to weigh in with their opinions, research, announcements, and insights on any pre-defined or ambiguous set of topics. Blog features may be deployed on privately owned websites, public content platforms, government sites, and university sites (ie: student blogs). Due to the limited restrictions on blogs and the authors producing content for them, blog related content often surfaces in search results about a business or person, and can become either a liability or be used as a positive asset in reputation management. Internet forums, or message boards, are online discussion sites where people hold conversations in the form of posted messages or “threads”. Forums can be general purpose or topic specific in nature. Messages can be a concise comment, question or a longer write-up on an area of focus or problem, which are often organized under specific topics of interest. Forum users are allowed to comment and collaborate in threads with other people, sometimes resulting in long web pages full of people’s comments, opinions, praise, or complaints. Forum pages (usually individual topics or threads) are indexed by search engines and often gain traction in the search results quickly. 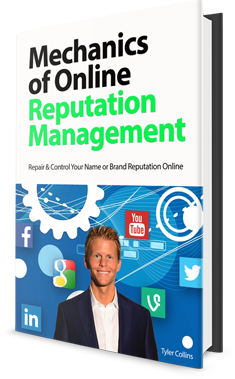 In reputation management, a forum thread is not usually a reliable asset in a repair campaign and more commonly pose as a liability, due to the free speech nature of the platform and participating users in the forum. Many websites offer video hosting and publishing options, and some are exclusively designed for the archiving and publishing of user’s video clips or productions. Popular video platforms such as YouTube and Vimeo are extremely authoritative with the search engines, with millions of users constantly engaging in the publishing, viewing, and sharing of video content. Users of video platforms are offered a variety of engagement options from uploading and publishing video content viewable to the public, as well as creating video channels, organizing playlists, liking or disliking specific videos, or leaving comments on other people’s content. Users, channels, playlists, and unique videos all receive a uniquely defined page on the video platform that search engines analyze, index, and serve in the search results. Videos and pages on these platforms allow for advanced optimization techniques such as titling, describing, tagging, even the polishing of video transcripts and captions – all of which are viewable and readable by search engines. Search engines treat video content with special consideration, as they are a unique form of media content that provide unique value to users searching on various topics. Like other content publishing platforms, video hosting websites offer users an element of free speech and behavioral expression, amounting to a wide range of videos featuring any imaginable topic, born from all points in the spectrum of opinion and sentiment. Videos about people and business often show up in top positions in search, sometimes as a positive or negative review or opinion about the company or person, which can lead to reputation problems or opportunities. Websites that feature content specifically relating to scams, fraud, and ripoff claims are typical in the landscape of reputation management problems. These websites allow anyone to claim that another entity is conducting a scam or suggest something in society is a ripoff. The most popular of these scam sites are commonly referred to as scams themselves, because many attempt to extort money out of the business or person featured in the submitted report, requiring them to fork over large sums of cash to even “respond” to a report published about them. Many a frustrated business owner is baffled by the mob-like mentality under which these sites are allowed to operate, and often the only economic solution to combat the negative effects these sites have on a reputation is to conduct a brute force search optimization campaign to suppress the publicly visible reports displaying in search. Earlier chapters reference how local and national governments archive and make public record information available to Internet users, and these sites are often a major problem for people with reputation management needs. The nature of content that can arise from a government filing such as a court case, lawsuit, intervention, legal offense record, or other matter of public record is not typically positive in nature. The government sites themselves (with the .gov domain extension) maintain an extremely high level of trust with the search engines, and in the public eye. Any page visible to search engines can be indexed and displayed in search results, and is usually awarded a top position by default. With very few access points for regular citizens, government related sites are usually only on the problem side of a reputation situation and can rarely be used as a tool in a repair strategy. Much like video hosting and publishing platforms, many websites today allow image publishing features and some are built exclusively for uploading, archiving, and organizing images and albums of images. These image platforms contain search features for discovering image media, and every discoverable image can also be found and indexed in the search results of search engines. Search engines treat images similar to videos in that they provide a unique format of media content, which may serve to be useful in the process of providing users correct or differentiated answers to their search queries. Search engines like Google and Bing have a dedicated “Image Search” that allow users to search exclusively for images on the web. Image search results are often the source of reputation problems in both the independent image search environment as well as regular web search. Negative image reputation problems can be difficult to overcome because of the authoritative nature of the sites on which the images exist. Search engines award tremendous authority to image platforms like Flickr, Pinterest, and others that have billions of images available for the search engines and users to access. Image websites can be both a source of problems and opportunities for improved online reputations. Later in this book we cover how to influence image search results and the precise steps to leverage opportunities using image platforms. Consumer and business review sites are available in great abundance throughout the Internet. Ranging from national consumer report sites to smaller local business reviews, these review websites allow users to submit reviews on any given website, business, person, product, or service depending on the platform. Examples of review sites include Yelp, AngiesList, TrustPilot, Choice, Better Business Bureau, Google My Business, etc. Review sites are social in nature as a majority of the visible content is user-generated and provided by the public. Comments embodying sentiment, passion and opinion can vary wildly and are often associated with a 1 to 5 star review. Typically, all comments and opinions published to reviews sites about a business or person are contained in a centralized profile page for that business or person, which search engines can read, index, and serve in their search results. Due to the nature of origin for the content contained on reviews sites, the frequency with which users access review site content, the size and authority of review sites, and unique value these types of sites provide users conducting searches, profile pages on review sites gain momentum quickly in the search results and often stick in the top positions. Profiles on review sites can be a very positive asset in reputation management or they can be an extreme liability. The difference is how well the profile is managed and maintained by the owner and the contributions from the public on that given profile. Be cautious of relying exclusively on any profile that allows public reviews, as these pages can get out of control quickly and may be extremely difficult to transform into something positive. The phenomenon of digital social networking underwent remarkable growth after the early platforms like MySpace and Facebook were created. Along with the original big players, today there are hundreds of social networking websites like Google+, LinkedIn, Instagram, Reddit, and Twitter that allow users to build social relations among people who share similar interests, activities, backgrounds, real-life connections, or nothing at all. Individual users can create public profiles featuring details about themselves, including biography content, images, videos, employment history, interests, favorites, friends, travel agendas, and a variety of different details about themselves that they wish others to see. Many platforms offer businesses the opportunity to create public profiles to represent their brand, product, services, or website, along with any and all details pertaining to the entity they wish to display. Most social platforms used today offer individuals and businesses posting features that allow them to make announcements, share resources, ask questions, or post anything they desire to show up in the content feeds available to users in their social network. Search engine crawlers devour these sites and receive a fire hose like influx of user-generated data, and just about anything they can read is stored in their index. Individual and business profile pages are rich with unique content and serve as a unique type of web property that search engines will commonly display in search results about that business or person. In reputation management, a properly managed profile page on a social platform may serve as a positive asset whereas a poorly managed profile may turn into a source of negative information and problems for the entity owning the profile. Also known as “job” sites, these websites deal specifically with employment and career opportunities. Many employment websites are designed to allow employers to post open positions with job requirements for prospective candidates to apply to, and others offer employer reviews, career and job-search advice, and describe different jobs or specific employers. Considering the user generated “reviews” features many of the bigger employment sites offer today, many employer profiles become littered with past or current disgruntled employee reviews about the company where they are currently or were formerly employed. The profiles on these job sites are readable by search engines and contain many of the rich details that search engines and users consider unique, often resulting in priority search placement for a brand. A well-managed profile on an employment site can be a positive asset in a reputation management campaign, but could also be the source of a problem depending on the nature of the employee reviews and how well the profile is populated with helpful information. Ranging from personal-social profiles to professional and portfolio and business related profiles, many websites exist for individuals and businesses to create unique pages about themselves on public sites. Hundreds of sites are dedicated to allowing the creation of individual profile pages, and many other sites not exclusively dedicated to social networking also contain social features and profile creation options. Almost every social networking website allows a user (whether representing themselves or a business) to create a unique profile about themselves. Other website types like News sites, Forums, Image and Video sites, and many other non-socially oriented sites also allow users to build a unique profile page about themselves. Business and people profiles show up in search results frequently for a person’s or business’ name search, and the content on those profiles leaves an impression with anyone who views them. Usually rich with details and content, profile pages are often considered a unique and relevant resource. Interestingly enough most profile creation sites do not require a thorough validation step to qualify the person or business creating the profile. Even sites like Facebook allow any user to create a “Fan Page” profile under almost any name – this named profile, which now labels what could be a very optimized profile on a person, business, or topic, often quickly occupies a top result in search. Many businesses and individuals find profiles created about themselves that did not originate from an authentic source, which can pose severe reputation problems if the profile created does not represent them in a positive light. Alternatively, a profile page can serve as a positive asset in search reputation results depending on how it is created and managed. Academic institutions regularly insist on having a strong web presence for course and administration related information, and many offer students the opportunity to blog, publish work, organize information, or create profiles. Many academic sites (defined by the .edu domain extension) are infrequently moderated and allow public submissions of content, with many entry points for current or alumni students to publish content. Many students find that other students have written negative things about them on a University student blog, and some teaches suffer the wrath of wide-spread student dissatisfaction and low professor ratings. Additionally, teacher review sites exist for the purpose of allowing students to share opinions and experiences about the educators they encounter throughout their academic journey. Once again, our socially dependent society takes form in the digital world in the materialization of academic reviews and editorial. Reputation problems can originate from school related sites, and for those who monitor entry points into .edu and academic site publishing options, school related sites can serve as an asset in a reputation strategy. Later in the book we discuss how many experts acquire link citations from academic websites to further boost the authority and trust of other properties on the web. Every day a new Internet platform is born with the potential to become a mega-publishing site. From industry specific interest groups, to local and regional community sites, to personal profiles and special interest forums, websites launch constantly allowing the public more and more ways to post, publish, create, share, comment, like, dislike, upload, archive, organize, present, communicate, collaborate, and control their relationship with the world around them. From highly moderated news websites to open forum platforms, there are hundreds of sites that allow the sharing of rich media and information. Understanding the nature of problems and the sites on which they originate is a knowledge foundation required to properly assess reputation damage and formulate an effective strategy to successfully combat the negative affects these sites have on a reputation. ORMBook.com is an editorial site by Tyler Collins SEO.